From now on no longer a cricked neck. 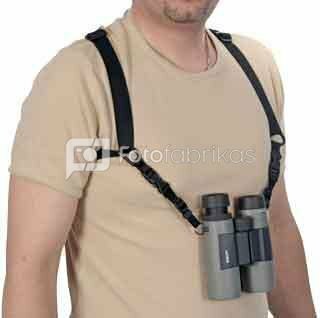 This is a comfortable solution for carrying your binoculars without any effort for hours. 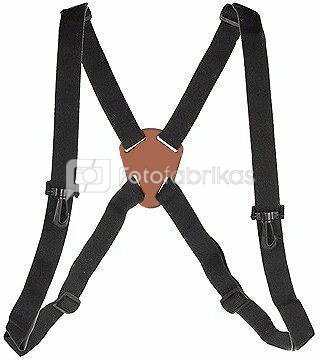 This binoculars harness spreads the weight of your binoculars evenly over your shoulders, this ensures a very relaxing view experience. This ingenious and sturdy belt ensures that your binoculars, range finder or camera won't dangle on your belly, while you keep your hands free. With the two quick releases you can quickly release or attach your binoculars to the harness. The durable nylon belt is elastic (one-size-fits-all) and easy to attach. 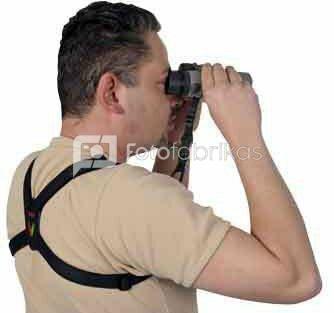 The slides are adjustable so you can easily set the binoculars to the correct viewing position. The carrying system is designed for people who like to hike, ride a bike, ski, ride horseback, mountain bike, etc.